For some strange reason Entourage 2008 adds your email signature at the very bottom of all replies and forwards in an email string. Not only will recipients not see your signature next to your more recent reply, if you reply to the same email string multiple times you end up getting a "stack" of your same email signature at the bottom of the message strings which looks quite unprofessional. Although Microsoft has made it as un-intuitive as possible, there is a fix for this issue that allows your email signature to appear only after your replies. 2. 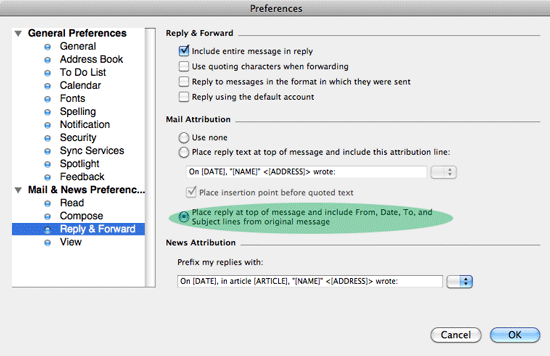 Then highlight "Reply & Forward" and check the box with the verbose description "Place reply at top of message and include From, Date, To, and Subject lines from original message"